Yay, a change from chicken! It’s Autumn and some nights just a wee bit cool for a salad. So I thought something a bit warming would be perfect, though not too heavy as it’s not Winter yet! I had some pork mince and undertook a little google search and found the following recipe on souffle bombay . Her photos are SO GOOD, and it definitely ticked all the boxes. I doubled the sauce ingredients just because I always want more sauce. Mr MWCED liked it too, so likely that it will be cooked again. Combine all ingredients together and form balls. Use a small amount of olive oil (2-3 TBS or so) to fry the meatballs until nicely browned. Note: I used purchased pork mince and was Very Annoyed about how much water came out of them. They were broiling rather than browning. Hmmmph. Note to self, either buy better quality mince or make my own. Place meatballs on a baking sheet and bake another 10 minutes until cooked through. In a pan combine sesame oil, garlic and ginger and saute for 1-2 minutes until fragrant. Add in vinegar, honey and chili with garlic sauce and bring to a boil. Add in cornflour and whisk until combined and thickened. Taste & adjust. I am a sauce fiend and made double the amount of the sauce. Doubled all ingredients, except the sesame oil, used 5 TBS of sesame oil. Definitely better amount of sauce when doubled – imho. Place meatballs in pan, coat with sauce, garnish with coriander leaves and serve. Oh Damn, no coriander in our garden tonight, so had to sub parsley. Coriander would definitey have been MUCH better. I boiled some beans and added them to the top of the meatballs when serving, and we also had saffron basmati. Just a pinch or so of saffron mixed into some warm water and then tipped into the bowl of the rice cooker. Add a little butter, rice and water and be happy. Another weekend, my cooking days, another chicken recipe. Yes, we eat a lot of chicken in our household, red meat hardly gets a look-in. Though from time to time a rare to medium beef steak can be seen, especially when number one son (and only) is home. Saturday night, getting a little frosty as winter starts to make its chilly breath known, and thinking something heartwarming could be the choice. Has to be easy though, tonight I don’t feel like spending a lot of time in the kitchen. I have chicken thighs, lots of vegetables and decide to make Herb Roasted Chicken. The recipe is from www.simplyrecipes.com/recipes/herb_roasted_chicken_thighs_with_potatoes, which I chose because not only did the recipe seem to be just what i wanted, but I liked their picture. ( And it only takes one dish.) Enticed by pictures of food……..what soulless human would you be if you weren’t?? 2 In a small bowl whisk together the red wine vinegar or substitute, olive oil, Dijon mustard, herbes de provence, 1/2 teaspoon Kosher salt, 1/2 teaspoon freshly ground black pepper. 3 Spread a teaspoon of olive oil over the bottom of a large (9×13-inch) casserole dish. Cover the bottom of the dish with the thinly sliced potatoes. Sprinkle with salt and pepper. Distribute the sliced shallots over the potatoes, and sprinkle again with a little salt and pepper. 4 Place the chicken thighs, skin-side up, on top of the shallots. (Or the side upwards where the skin would have been!). Wedge the garlic cloves between pieces of chicken. If you have fresh herbs such as tarragon or thyme, you can wedge them in along the border, between the chicken pieces and the dish. 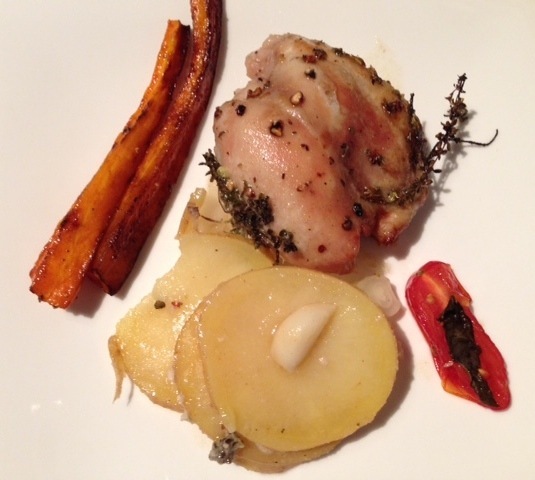 (I put the herbs everywhere the garlic was – not just along the sides of the dish). Whisk the vinaigrette again and pour it over the chicken, spreading it with your fingers to make sure the chicken is well coated. 5 Bake uncovered in a 375°F oven for 50 minutes, or until the thighs are well browned and cooked through. Remove from oven and let rest for 10 minutes before serving. Remember that without skin the chicken won’t quite have that same ‘browned’ look – but you should manage some colour. 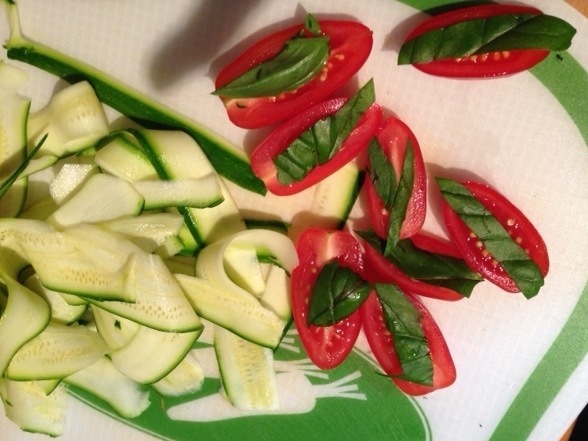 ribboned courgette and basil tomatoes, ready to be added to the roasting carrots…..